Looking to save some money this summer? Why not start with this DIY face wash recipe that only needs 2 ingredients? The ingredients are baking soda and coconut oil…and that’s it! These ingredients are easy and cheap to get and will last you a loooong time! The reason we love this DIY face wash recipe is because it actually does wonders for your skin! Keep reading to see why this face wash is SO good! Baking Soda is a natural exfoliant as well as a natural bleaching agent. The little granules in baking soda gently exfoliate the skin, gets rid of dirt and impurities, and prevents blackheads and breakouts from forming. The bleaching agent in baking soda helps to rid the skin of acne scars, dark spots, and age spots. Coconut Oil contains fatty acids which get deep into the skin to hydrate and prevent premature aging. Coconut oil is also great at filling in fine lines as well as reduce the appearance of age spots, dark spots, and acne scars. When you combine these two ingredients together they truly make a powerhouse of a face wash! Gentle enough to use every day, and effective enough to fight acne and breakouts, fine lines and wrinkles, and really everything in between! Remove any traces of makeup. 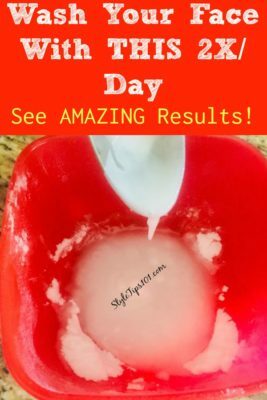 Check out this DIY makeup remover! 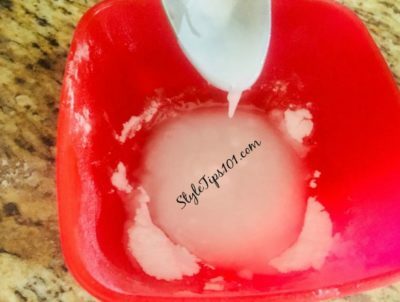 In a small bowl, mix the baking soda with melted coconut oil. Apply to wet skin and rub in slow, circular motions. Focus on oily areas such as the T-zone. Follow up with a light moisturizer if you have dry skin.